I visited this past weekend, and was impressed by how lively it was. It definitely wasn't much of a 'farmer's' market, but, it seemed very successful in getting people out and about in that part of town. To be honest, I've only been to the Farmer's Market one other time in my life and that was this time last year when The Shed first debuted, so I don't have much of a frame of reference for how lively it usually is and how it used to be back in the day before they re-developed the area. Anyway, I don't have any updates regarding the Farmer's Market development, but I was curious to know how far the Farmer's Market development was close to being complete, and what, specifically, was left to be developed. The fact that Urban Farmhouse Designs is opening at Harvest Lofts later this year is sort of a big deal. Looking forward to seeing what other retailers might open there. The three blocks, now surface parking lots, are near the Farmers Market and just across the highway from the redeveloping Cedars neighborhood. "I'm planning a retail-centric development," Hoque said. "But I'm taking my time. He's doing master planning for the property and hopes to have a design ready in about six months. The area between City Hall and the Farmers Market is one of the only places left downtown where developers can acquire large blocks of property. Real estate brokers say land in the neighborhood is selling for more than $50 per square foot. It's gotta be the three blocks just south of Dallas City Hall. Definitely the two blocks in red, but I can't tell if the third block he is referring to is the yellow or the purple. I could be wrong, but based on the information in the article, these are the only lots I can see that fit the description. It's cool to hear a few parking lots are up for grabs. I shouldn't be complaining, but of all the parking lots, these are probably some of the last I'd care to fill, just because they are on the outer edges of the CBD and, IMO, they don't really negatively impact street-life all that much. With that said, I definitely welcome some more development in this part of town that could potentially help connect City Hall, the Convention Center and the Farmer's Market. Thanks DPatel304. I agree. I think he means those lots too. The article says Hoque is a restaraunt guy turned developer. I wonder if he is taking his inspiration from Phil Romano and is thinking of something like Trinity Groves for this site but with some retail. I think the intersection of Cadiz and Marilla is planned to be a new park. So only one block of old buildings intrupts his connection to the Farmers Market retail crowds. I can confirm it's the red and yellow tracts (minus the Fire Hall at the corner of Akard and Cadiz). I thought Turkish Mike owned those properties... ? Lynd Development Partners has applied for building permits to construct a 297-unit, $33.5 million apartment project at 1915 Cadiz near Harwood Street. muncien wrote: I thought Turkish Mike owned those properties... ? Maybe Turkish Mike is the person from whom this guy bought the properties. Hopefully in this new guy's mind, a "retail-centric development" is still heavily mixed use and not another Shafer Plaza. eburress wrote: Maybe Turkish Mike is the person from whom this guy bought the properties. Yeah that's worrisome thing about it. This guy has no experience with developments. Who knows what he comes up with. Hopefully the FM Resident Association is vigilant. I'd hate to see strip mall come here. Y'all, lets not get crazy. 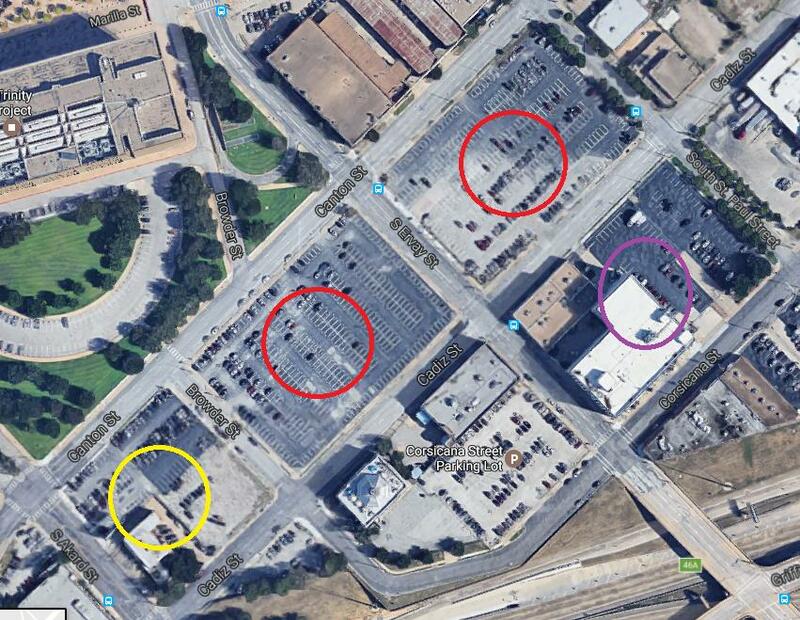 The planned apartments are planned just west of the Farmers Market complex. Couple of things: 1915 Cadiz is the address of the pottery store facing the Farmers Market. 297 units seem like a lot for that triangular piece of land, so I wonder if they also purchased the triangular lot to the north with the intent of combining them by closing Marilla. I also think that site was once considered for a downtown park by Parks for Downtown Dallas. 297 units on a plot that small would mean at least mid-rise to high-rise, right? Google maps shows this plot as an the triangular piece of land where "Amigos Pottery" store is. I was thinking that too. Almost 300 units on such a small piece of property, assuming it's not going to be combined with other lots, would have to mean this would go vertical. This is a new property in Austin they built. Looks promising. Maybe this project wont be as big as Austins but we can hope something that enhances the street level around the FM. Yes, the two "red" blocks on the Google maps image above were the blocks supposed bought be Turkish Mike, and this is where he "planned" to build two 80-story and two 60-story buildings. On Jan. 13, Lynd Development Partners, a division of the company, quietly closed on six parcels of land under the name FM Cadiz Owners LP. The assembled lots create a single rectangular area that is roughly one-third of a city block. The total area came to 1.34 acres. The price was undisclosed, however, the combined appraisal values total about $2.35 million. The property is immediately west of Harwood Street, which is the TIF boundary, so Lynd won’t benefit from the district’s tax credit financing. According to city and other government records, Lynd is planning a 452,846-square-foot development that will include a five-story residential tower and an adjacent four-story parking garage. Feb. 28 applications for building permits reveal that the residential building will have a footprint of just over 61,400 square feet and 297 units. The total estimated cost is $32.5 million. Lynd retained the services of Merriman Anderson Architects, and the project name is Farmers Market Residential. Well the other buildings near by aren't very tall either. It can be successful in its own right if it masks the garage and has a great street presence. A great street presence is the key in this development. Though I too loath that it is a mere 5 story building. I would like to see this area fill up with at least one or two skyscrapers. Is it just me, or is it a big deal that this spot is outside the TIF area? Really enjoying the revitalization of the Farmers Market, anyone know what this brings the total potential resident count to? This is great news, and with all these lots filling up developers will eventually have no choice but to go vertical. exelone31 wrote: Is it just me, or is it a big deal that this spot is outside the TIF area? Total units is around 2500 with this addition. So, the total resident count will be close to 3400-3500 (1.5/unit with 7% vacancy). Would like to see a few more development pop up soon to push the count to 5000 to cause better spillover and connection with EMC. Has anyone heard when Urban Farmhouse will open? joshua.dodd wrote: A great street presence is the key in this development. Though I too loath that it is a mere 5 story building. I would like to see this area fill up with at least one or two skyscrapers. 5 stories is preferable in almost every possible way to a skyscraper, especially if one cares about street presence. 5 story (more or less) buildings frame the street in a beautiful way, are human-scaled, and provide a sense of enclosure. This is a design concept that has been understood for generations. This is why people consider Paris the most beautiful city in the world. Disappointing that Dallas is finally developing a beautiful, human-scale residential neighborhood downtown and people want to ruin it with skyscrapers, creating an irregular, jumbled visual pattern, a poor street presence and an unwelcoming feel. Plus, once all these vacant lots fill up with low rises, there's a lot more justification for skyscrapers! Win win. cconat2000 wrote: 5 stories is preferable in almost every possible way to a skyscraper, especially if one cares about street presence. 5 story (more or less) buildings frame the street in a beautiful way, are human-scaled, and provide a sense of enclosure. This is a design concept that has been understood for generations. This is why people consider Paris the most beautiful city in the world. It's so annoying to me when people dress up personal aesthetic preferences as objective facts. Manhattan.. it's a hellscape, apparently. Ruined, utterly ruined. If only it were half the density, then people might want to live or visit there. What's that, you say? The Upper East side (aka the tallest neighborhood in the county) is one of the wealthiest places in the country? They *choose* to live there?! And hordes of tourists come to the city to walk around the tall buildings and gawk at how exciting it all is? Well I'll be. Personally, I love the irregular, jumbled visual pattern. It's what makes walking around cities interesting to me. It's totally ok that you love a particular height with a repetitious design aesthetic. But it's a personal preference, that's all. Low/mid-rise works for European cities because their streets are so narrow that they can still achieve densities unmatched anywhere in the US outside NYC. Cap American cities at 5 stories and you get LA, not Paris. LOL... Y'all are both right in many ways. The only issue with high-rises is that we don't seem to be able to do them right. But, that doesn't mean they can't be done right. The key is those bottom 2-5 floors of any structure. That is where 90% of your interaction is. What happens above that (if anything) is less important. The harder part for high-rises is how you manage the utilitarian aspects (loading docs, garbage, mechanical) for so much floor space without gobbling up too much street frontage. It's doable, but it ain't easy. muncien wrote: The harder part for high-rises is how you manage the utilitarian aspects (loading docs, garbage, mechanical) for so much floor space without gobbling up too much street frontage. It's doable, but it ain't easy. Don't be surprised if a whole lotta existing tunnel retail space turns into storage for those big residential conversions. Those damn tunnels should be converted to affordable housing. I've been to Paris. It's a hellhole. The city used to be beautiful. But now it is turning into a giant ghetto with college kids constantly protesting and homeless people literally everywhere. I was there last year during the Euro Cup. I saw some but to be fair I see more here in the states tbh...The European govts do a good job providing mental health care to those folks. The thing with their homeless is that they'll​ go up to with notes in written in English asking for money so it's kinda odd and creates an impression. But for the most part I think it's worse here. In London it's rare that I see a homeless person. In Amsterdam... I've never seen one. No place is as bad as SF tho.. that's the worst. Now that we have established the extremes; "Paris is a hell hole" and "Paris is beautiful" can we find a happy middle ground? Will we choose to see the intelligence in some of its development decisions and try to integrate the smarter design solutions while trying to avoid whatever pitfalls may have also developed or is that too Pollyanna? tanzoak wrote: It's so annoying to me when people dress up personal aesthetic preferences as objective facts. Is Madonna as good as Beethoven? Hey, it's all subjective! Towers are fine in NYC or EMC in Dallas (though not as welcoming or affordable to maintain). But in Farmer's Market you already have a nice, incremental, human-scale architectural pattern. Putting a high rise in the middle of that where it's completely incompatible with everything else is a level of aesthetic incompetence rivaling the Tour Montparnasse. As you can see above, it's not a "repetitious design pattern" at all. Similar building heights create consistency and compatibility, and the different design of each building creates FAR more diversity of looks than the single design of one big monolithic tower. Dallas's core needs more granular architecture. Hell, right in Dallas you've got Monte Anderson and the Incremental Development Alliance trying to teach people that incremental, granular development is an approach proven to work over literally thousands of years (lots of people making small bets), whereas huge-scale development is based on large risky debts, government shuffling money around in a Ponzi scheme, etc. Just an honest disagreement, though. Best wishes. The old white warehouse building on the north side of the Shed has been demolished. I guess the final residential building is on the way. Good news! That's going to make a huge impact there. Is this a highrise? Wasn't a 15-20 story apt part of the plan? This would be the Taylor Lofts, correct? The only thing I can find on the website is that leasing will start in 2018, so it sounds like it won't be that big of a building if they plan to finish sometime next year. I'm totally okay with that, as long as street-level is good, I'm just curious to know more about this. Why can't get we get some residential towers over here? Tivo_Kenevil wrote: Why can't get we get some residential towers over here? I for one am glad they are keeping it down in scale. A farmers market in Texas will never be the same attraction as a market in Europe, but it makes for a good brunch, a nice stroll and a neighborhood anchor. The Farmers Market area has always been (except for that one time someone proposed 2 office towers across Cesar Chavez) focused on being another State Thomas that bolsters the urbanity of downtown while keeping it at a human scale. Jane Jacobs would be proud. Yes, I agree it's good to offer the variety in the CBD. If you want the smaller scale but still urban dense and walkable move to the Farmers Market area. If you want the very busy metropolitan walkable tower living you should move to the Main Street district area. If you want to be locked up in a tower with a park view the Klyde Warren area has options as well. The West End provides a warehouse/gas light feel because of the nature of its buildings so that's an option as well. Closer to city hall will be where towers may spring up if demand gets that high. To do that the Cedars will also need to be moving more than it is today. I doubt the area around city hall and the convention center will get much action until two things happen HSR and/or the Cedars gets filled in more. This is a case where rising waters floats all boats.